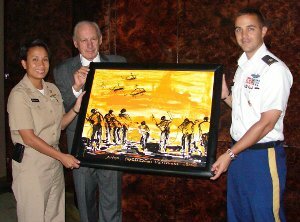 LCDR Kim Mitchell (left) and MAJ Ed Kennedy (right) accept a giclee of the painting “Wounded Warrior” from Academy President, Dr. Thomas P. Rosandich, during their visit on 2 September. The original five foot by seven foot painting, by 2002 Sport Artist of the Year Mina Papatheodorou-Valyraki, was later presented to the guests who will display it at the Pentagon. U.S. Army Major Ed Kennedy sees huge potential in utilizing the United States Sports Academy’s academic programs and online technology to assist soldiers with making the transition back into civilian life. Major Kennedy made these comments when he and U.S. Navy Lt. Commander Kim Mitchell visited the Academy’s campus on Thursday, 2 September. Both Kennedy and Mitchell are a part of the Joint Chiefs of Staff Warrior and Family Services Program. The Academy is working with the U.S. military “Wounded Warrior” program to deliver its education programs to military personnel who are ill, wounded, and/or disabled from post-9/11 overseas combat duty. Major Kennedy said the Academy’s online program would be very convenient not just for the wounded soldiers, but the non-wounded as well, because a soldier is “always on the go.” He also saw the Academy’s mentorship program, which incorporates experiential learning as a complement to a student’s academic program, as a good tool to help soldiers transition into civilian life by getting the experience needed to obtain employment. A white paper entitled, “The Sea of Goodwill,” written by Major John W. Copeland and Col. David W. Sutherland, Director of Warrior & Family Programs, focuses on three key elements in helping veterans and their families reintegrate into civilian society: education, access to health care for life, and employment. The Sea of Goodwill brings a holistic balance to the Wounded Warrior Program, commonly known as the “trinity.” These three key components are necessary to ensure service members and their families achieve a seamless transition back into civilian society.